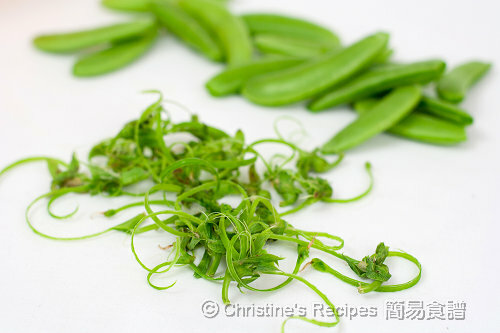 Peas are commonly used in Chinese stir fry. It’s not only because they have green fresh colour, but also they add more texture, and make the whole dish more enjoyable to eat. 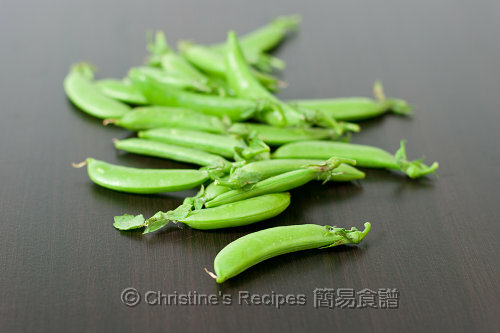 Sugar snap peas (aka sugar peas or snap peas) look similar to but actually differ from snow peas. They have round pods as opposed to the flat shape of snow peas. We’re not quite into eating them raw for their grassy taste. Stir frying sugar peas briefly over medium-high heat will bring up their natural sweetness, while their crunchy texture can still be maintained perfectly. 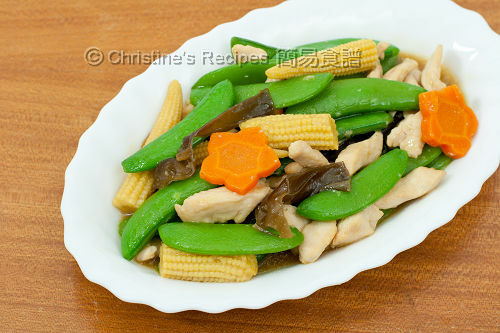 This Stir Fried Sugar Snap Peas with chicken has a lot to offer in texture, crunchy sugar peas, with smooth cloud ears and crisp baby corns. The authentic Asian taste of this dish will surely win the hearts of those who like healthy, quick Chinese stir fry. Soak cloud ears until softened. Blanch in boiling water for 2 to 3 minutes. Trim the roots. Cut into smaller pieces. Set aside. Julienne chicken and mix with marinade. Set aside. Remove the tissue running along both sides of the peas, from tail to top. Rinse and blanch in salted water for about 2 to 3 minutes, over high heat. Immediately soak in cold water until cold to touch. Drain well. Heat oil in a wok or deep frying pan over medium-high heat. Add chicken and cook until its colour turns white. Set asid. Use the same wok. Add more oil. Saute garlic until fragrant. Add carrots, baby corns and stir fry. Toss back peas. Sprinkle wine, pour in stock. Season with salt. Add cloud ears and cook until sauce dries up a bit. Add chicken and stir quickly. Pour in thickening and cook to preferred consistency. Serve hot. This dish looks soo appetizing!!! The colors are amazing! simple and healthy dishi yeah sometimes i cld mixed up the snow peas with this one. just made your pumpkin chiffon few days ago and it was nice. i will let you know when i post that up. have a great day! 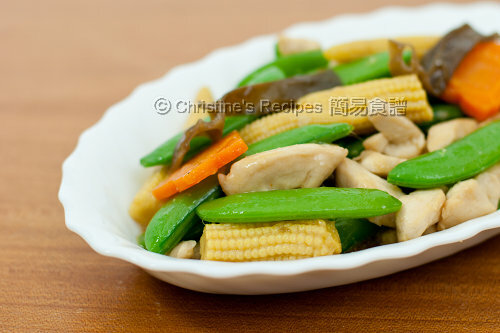 Wonderful looking stir fry, love the sugar snap peas here! YUM! I like sugar snap peas, so sweet and crunchy. One of my favourite dish! I am going to cook it tonight! I love it with some mushroom too... delicious! Simple stir-fry is always good! Beautiful pictures, Christine! Love this simple stir-fry, cook it often at home too.